You know when you just find that one thing that is so affordable and amazing that you think 'why didn't I try this out sooner and how the hell don't more people know about this?' That's exactly what I thought when I was watching one of Casey Holmes' videos where she tried out some Lottie London makeup. One of the things she tried out in that video was this Lottie London Shimmer Squad highlighting palette and it looked absolutely amazing on her so I thought I would try it out for myself. 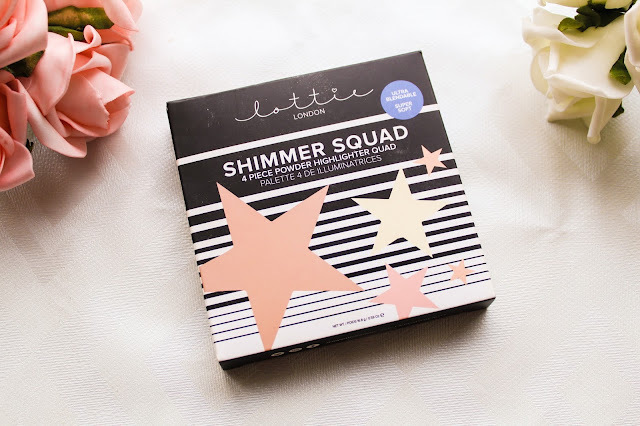 I went online to the Superdrug website because I knew that my store didn't sell that much Lottie London makeup and I didn't want to take a trip into town to not be able to find it, also, ordering online was soo much easier lol! The colours looked gorgeous and I could not wait for my package to come in the mail, so let's get on into the review. 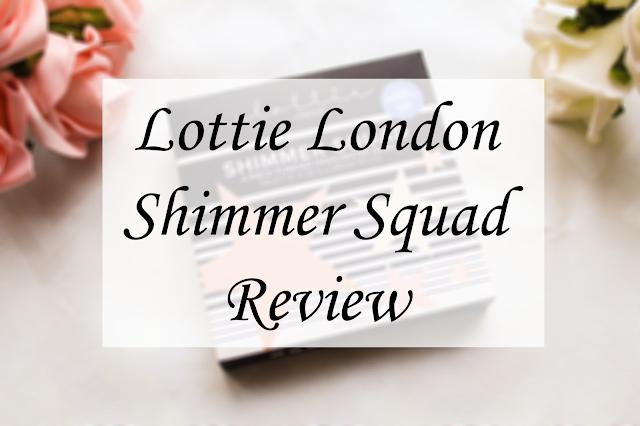 Lottie London says "Meet your new BFF’s in Lottie London’s Shimmer Squad palette. Featuring 4 natural ultra-blendable powder highlighters that will strobe and illuminate all skin tones. Apply directly to cheekbones, brow bones, cupid's bow and wherever the light naturally catches the face to add instant luminosity and glow to your complexion." Lottie London is a brand that has slowly but surely crept onto my radar a few months ago. I have always liked their cute packaging and their nail polishes are soo cute too. I had picked up some of their brushes and sponge a while back and I really loved them but it wasn't until recently that I started to take interest in their makeup. Lottie London is a PETA certified, cruelty-free brand that describes itself as being the 'home of trending beauty'. 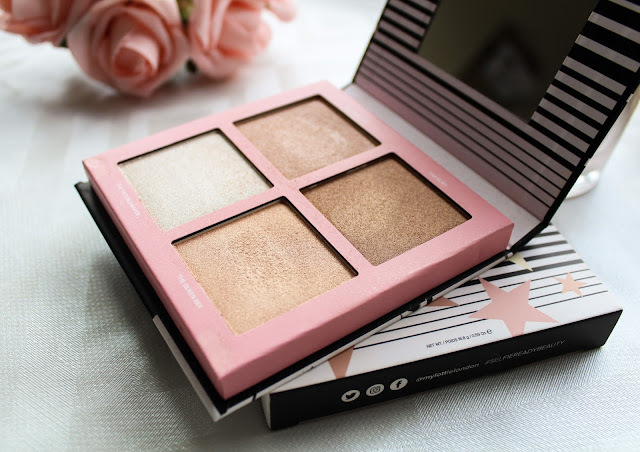 Highlighters and highlighting palettes have become super popular in the last couple of years and I have fallen into the trap so when I seen Casey Holmes review this in one of her videos I just had to pick it up for myself. So the palette in itself is so cute, I just love the packaging and the fact that it comes with a mirror is just a bonus. I actually bought this palette online instead of instore so I didn't get the chance to swatch the colours beforehand but when it arrived I couldn't believe how soft and buttery it felt, and it was so pigmented too! 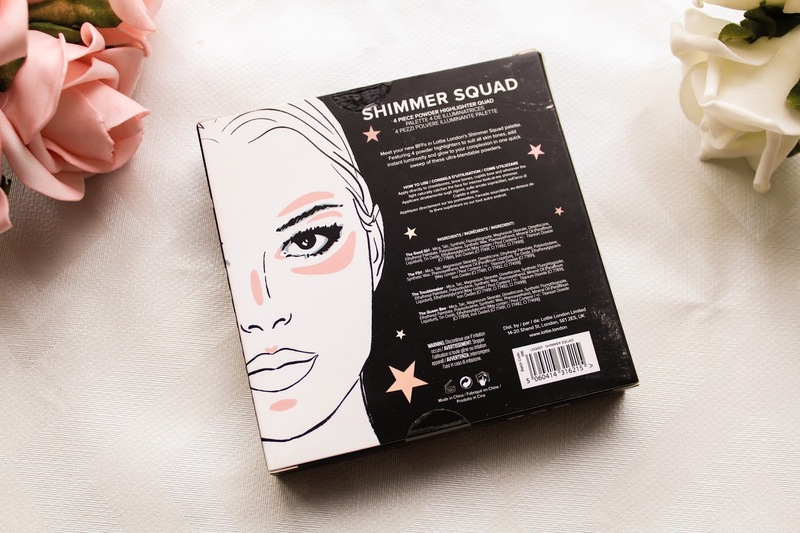 The Shimmer Squad palette contains four highlighters: The Good Girl, The Trouble Maker, The Queen Bee and The Flirt. The Good Girl is a stunning champagne colour that looks like it has a slight pink tone to it too. 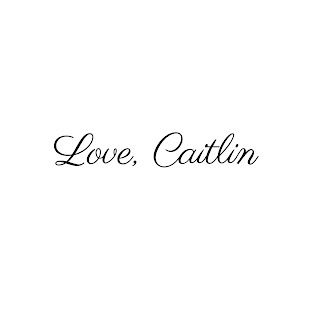 I absolutely love this colour as it is the perfect everyday shade and will be beautiful on most skin tones. The Touble Maker is definitely a lot paler and is more of a white and icy shade. I have used this on my skin but I did find it a little too white for my skin tone. However, people who have super pale skin might get on well with this. It would also be really pretty to wear for nights out or special occasions or to even mix with the other shades. The Queen Bee is a light gold colour that has a champage/peach undertone to it. 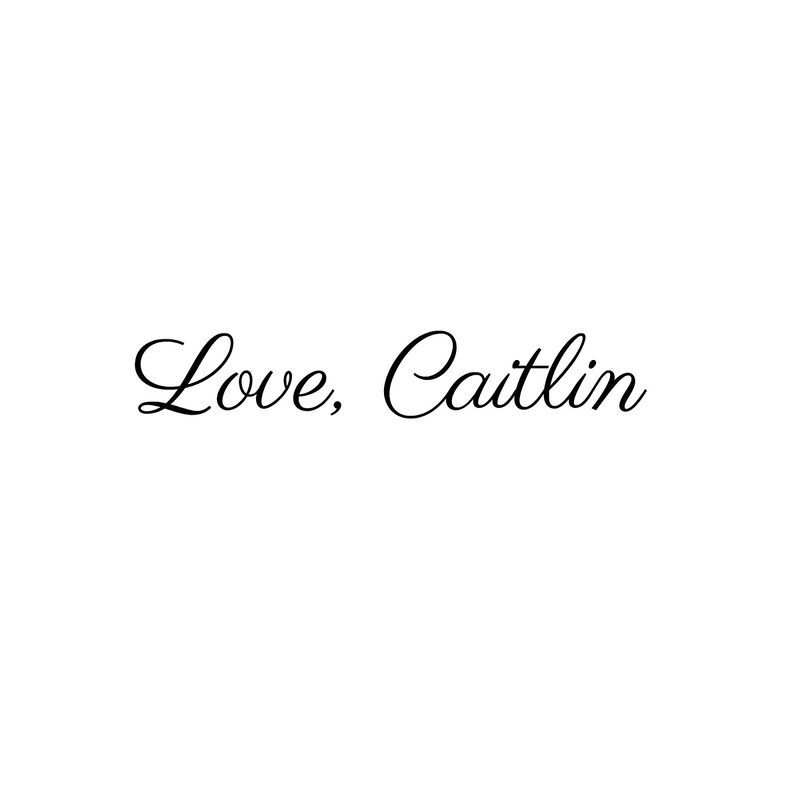 It would look gorgeous on pretty much all skin tones and is perfect in the summer time for a golden glow. When swatched it looks a little dark but once it has been applied to the skin it doesn't come off that way. The Flirt is the deepest of all the shades and is a deep bronze/gold colour that is gorgeous. It would be perfect for people with deeper skin tones. Personally, I wouldn't be able to wear this shade as it wouldn't suit my skin tone at all but I love that there is a shade in this palette for every skin tone. What I love about this palette is that there is a shade in here for everyone and you are also able to mix the shades and make your own custom shade. Like I mentioned I don't wear the deepest shade The Flirt as it is too dark for my skin tone but I would definitely use it as an eyeshadow. The Queen Bee and The Good Girl are my favourite two shades, plus I think the palette has cute and fun names. Formula wise, they are much better than I had expected, all four of the shades are powder highlights. I wouldn't call them the softest formula ever but they feel a lot softer when applying them to the face. I did notice when swatching them on my hand that they were powdering and there was quite a bit of fallout with them. 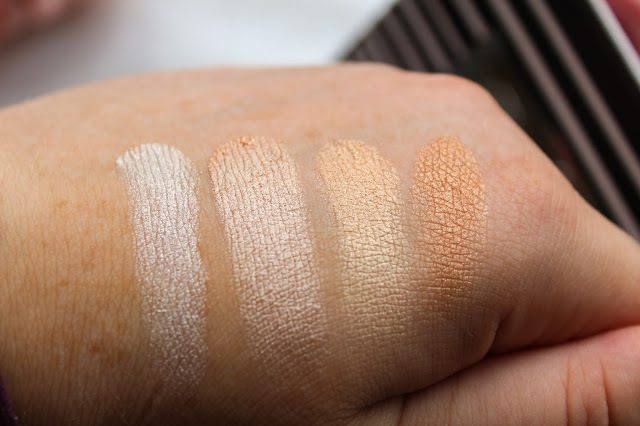 The pigmentation of these highlighters was something that shocked me, because of their slight powdery-ness I thought that the pigmentation wouldn't be anything too spectacular but I was definitely wrong. Especially the shade The Trouble Maker is highly pigmented. They are easy to blend and are definitely buidable if you like a strong and intense highlighter. This palette caters to both those looking for a natural highlight and also those who are wanting that bliding Instagram glow. The shades like I mentioned are gorgeous and very much on the warm side. This palette retails for £9.95 and I thought that was really reasonable for 4 shades in a really cute compact with a mirror, plus the pigmentation and formula is fantastic. You can pick this highlighter up from the Superdrug website. Left to Right: The Troublemaker, The Good Girl, The Queen Bee, The Flirt. 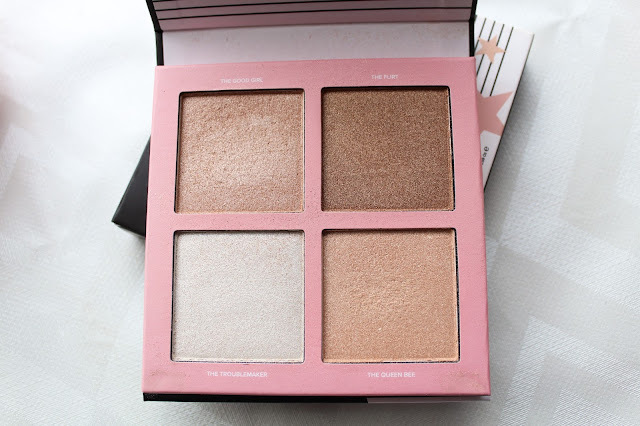 Overall, I think that this is a fantastic highlighting palette, they apply and blend beautifully and it is also super afforadable so perfect if you are on a budget. I think the fact that there is a shade for everyone in here is also a bonus. I would highly recommend this to all of my friends. Have you tried anything from Lottie London before? Let me know what you thought in the comments! Tell me about it! I hope that more people purchase this and fall in love with it like I did! It's an amazing palette!